The Sheffield Political Economy Research Institute (SPERI) has today published a new research brief. Reforming the Treasury, reorienting British capitalism‘ – by Craig Berry, Andrew Gamble, Colin Hay, Tom Hunt and Tony Payne – contributes to perennial debates about the role and responsibilities of the Treasury, and its dual role within Government as both the ‘economics ministry’ and the ‘finance ministry’, which have been given fresh impetus by the review of the Treasury currently being conducted by Lord Kerslake. 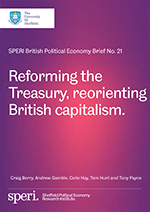 SPERI’s Brief looks at previous attempts to challenge the Treasury’s pre-eminence within government over economic policy, and suggests that the Treasury should be accepted as the dominant economics ministry with political capital and effort spent instead on reforming its role, responsibilities and mandate. We argue that creating an alternative economics department within government – for example, a ‘beefed up’ business department – would have only a limited impact. The Brief also sets out how and why a ‘developmental’ approach to the Treasury should be considered. It outlines the need for a new growth model for British capitalism and how the Treasury can oversee its development and functioning, before suggesting a new approach by means of which the Treasury can better ensure economic stability and regulation which would involve rethinking the role of the Office for Budget Responsibility and the Treasury’s interaction with the Bank of England’s financial regulation. Download ‘Reforming the Treasury, reorienting British capitalism’ here.